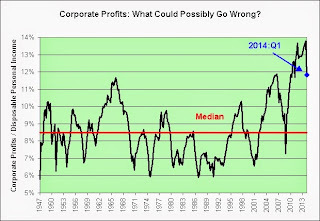 The following chart shows corporate profits after tax (with inventory valuation adjustment and capital consumption adjustment) divided by disposable personal income. For those keeping track at home, the last two recessions took us well below the median. 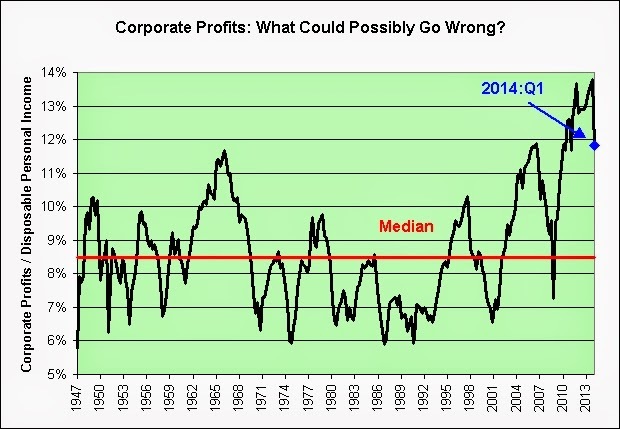 Thanks to the highly experimental and mostly untested (over the long-term) monetary policies of the Fed and the ongoing benign neglect of Congress, it can't ever happen again of course! Shingles pain or no Shingles pain. How could I not post this chart? Good grief. Actually, it's all good. I really needed to resume a sense of normalcy in this abnormal economic world we find ourselves in. Balance is key. Special thanks to the economy for helping me out! Woohoo! Now where are my pain killers? Hahaha! Sigh.